To me, there’s no better holiday tradition than overeating without guilt. Stuff your face with extra stuffing? No problem, it’s Thanksgiving. If you can’t fill your gut on Thanksgiving when can you? Devoured that box of chocolate-covered popcorn in one afternoon? Hey, blame the Boy Scouts for delivering it during the middle of the holiday season. So, continuing with my December sweets blitz, I decided to try another candy recipe to warm my belly on a cold, winter Midwest day. 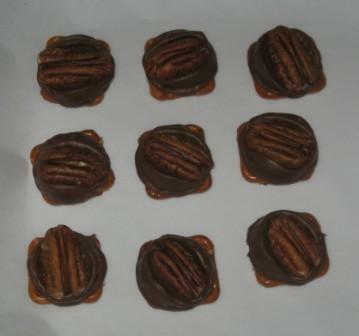 This time, Iâ€™ve discovered what may be the easiest ever candy to make from “scratch”: Rolo turtles. The sharp-eyed reader may have noticed that I put the word “scratch” in quotes. Unlike grocery store sign writers who put the word “chicken” in quotes in their store windows – Fresh “Chicken” only $3 a pound! – I actually know how to use quotes correctly. Now this “from scratch” recipe requires no flour, measuring or mixing. Perfect for the man who hates baking but loves eating.